When rumors about the Galaxy S9 first started coming in last year it was claimed that the Galaxy S9 and Galaxy S9+ would have notably reduced bezels compared to their predecessors. That would have meant that Samsung would further improve the screen-to-body ratio and push the envelope on the look of a bezel-less display. However, it was reported last month that the Galaxy S9 may not have slimmer front bezels because the improved design with reduced bezels failed to make the cut. 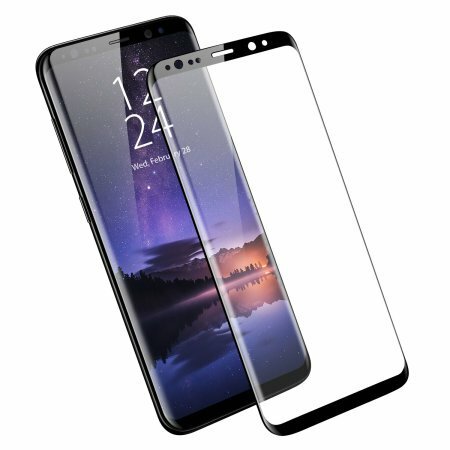 Third-party accessory manufacturer Olixar has revealed its first Galaxy S9 and Galaxy S9+ screen protectors today and they confirm that these handsets will have the same screen dimensions as the Galaxy S8 and Galaxy S8+. Even the front camera and sensor placement is said to be the same. If these reports are accurate then the Galaxy S9 and Galaxy S9+ will look almost identical to their predecessors from the front. They are said to feature the same 5.8-inch and 6.2-inch panels. A recent report has also claimed that the new handsets will also retain the 18.5:9 aspect ratio. Olixar’s screen protectors for the Galaxy S9 and Galaxy S9+ are now available for pre-order exclusively from Mobile Fun. The product image in the listing also suggests that the new handsets will be identical to their predecessors. That’s not necessarily a bad thing. The Galaxy S8 had one of the best designs of any smartphone released last year. I’m sure many Samsung fans will be pleased that the company is sticking to a winner. Samsung is expected to unveil the Galaxy S9 and Galaxy S9+ at the Mobile World Congress 2018 in February. So A8 gets dual front camera but S9 still has one ? I am a total Samsung person but yes iPhone X does look good and the front camera with portrait mode and portrait lighting ACTUALLY is a winner and I was hoping for S9 to get the feature. Instead they decided to bring dual back camera in S9+ !! I love Galaxy S series’ over Notes due to size factor and Samsung just ruined it !! So I will wait for the Note9. If they screw up with this phone as well, then I will looking for the new brand. I am changing phone every year, so maybe S10 will be good for me. If this year samsung don’t make a flagship phone with none curve edge screen, I will have to look at other brand. It’s crazy that Samsung force user to buy that useless but troublesome curve screen. tbh with the s8 99% of the time i forget it has a curved screen and I have not had any issues with any incorrect inputs as I had with the s6 edge. the advantage of the s8 curved screen does provided a narrowed and sleeker design shape.